The dense, wavering drone that Robert Curgenven committed to tape when performing live in Cornwall at the Exchange back in August 2011 has been made available for free download by the great touchradio.org.uk podcast series. The drone consumes the listening space, but it is not the entire space. There are fragile elements within it, the static of what could be a crackling fire, high notes like a soloist from a robot boy’s choir practicing circular breathing, clusters of organ chords. Those latter elements are the highlight. 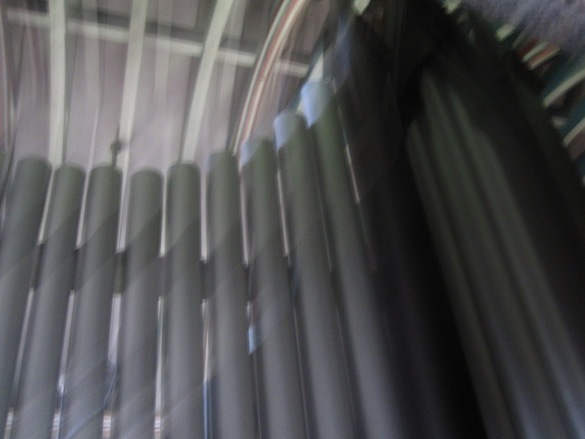 Curgenven describes the material as “Unprocessed recordings of a 16 foot pipe organ – built 1861, standing in a 13/14th Century rural church in West Penwith, Cornwall.” Among the additional elements are “guitar feedback, unprocessed field recordings, ventilator and microtonal dubplates & turntables.” And the overall density is owed to room tones from “contained and reverberant spaces in the cities of Berlin (2007), Tokyo (2006), Sydney (1999), Milan (2008), Hamburg (2009) and Osaka (2006).” The original performance was an eight-channel set-up at the Exchange, which is in Penzance, Cornwall, as part of an exhibit titled An Urban Silence, which was organized by Blair Todd. This recording (MP3) was made by Martin Clarke, and then mixed and mastered by Curgenven. Track originally posted for free download at touchradio.org.uk. More from Curgenven at his website, recordedfields.net.